Jodi of “Meaningful Mama” is a wife and Mother of Three. 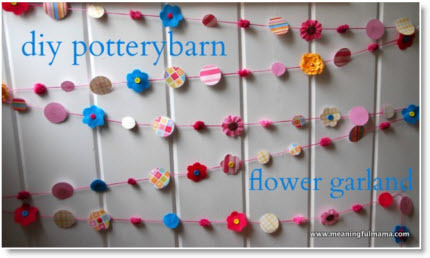 Jodi’s idea is a Knock Off from “DIY Pottery Barn Kids Flower Garland”! Her daughter’s birthday party was coming and she wanted a spring party. Jodi came across this garland in the Pottery Barn kid’s catalog and she knew she could make it. She had the materials on hand and she created it and is sharing her tutorial with us. Thanks Jodi!